Most people say that they look forward to the weekends because they have time to make a bigger, more substantial breakfast. Not me. I have infinitely more time during the week (not that I make big elaborate breakfasts... Caroline and I love our oatmeal!). We almost always have plans for Saturday mornings, whether its a tennis match, a road race, tailgate, or going to visit my family. And don't get me started on Sunday mornings. Nevermind that we have a permanent alarm clock that prevents us from sleeping past 7am, we always manage to be racing out the door for church with no time to spare. So I actually am more inclined to want a grab-and-go breakfast on the weekend. Which brings us to these scones. They certainly can be made the day you plan to eat them, but they are also perfect if you make them the night before, refrigerate, and then bake them off in the morning. In fact, I have made them several times, and I feel like I get a higher rise when I prep them the night before and refrigerate overnight. I'm sure that has to do with the butter being very cold and helping to produce the tall scones. I also realized that I added the incorrect amount of baking powder, so that definitely had an effect as well! The scones pictured were made and baked the same day, and they didn't bake up as high as they have previously. But they still tasted fantastic! Tender, moist, and sweet, with perfect little bursts of blueberry throughout. This is definitely the most unusual technique for making the scones as well. First, the butter is grated and frozen, so there are are nice bits of butter throughout the dough. The dough is rolled out, then folded, and rolled out again, as if pastry dough. And finally, the blueberries are pressed into the rolled out dough, and then the final dough is rolled up like a cinnamon roll, flattenened to a rectangle, and cut into the characteristic scone wedges. Here is the video from Cook's Illustrated that does a wonderful job demonstrating the techniques. These are a huge favorite in our house, and I can't wait to experiment with more fruits - raspberries, blackberries, and strawberries all sound fabulous! Grate the butter on the large holes of a box grater, and freeze. Preheat oven to 425, and combine the dry ingredients. Stir in frozen butter. Whisk together the sour cream and whole milk, and stir into the dry ingredients with a wooden spoon until just combined. The dough will be crumbly, but that's okay. Turn out onto a well-floured surface, and knead a few times. Roll out into a 12x12 inch square. Using a bench scraper, fold the dough into thirds, then fold into thirds again in the opposite direction to form a square. Roll the dough out into a 12x12 inch square again, and refold. Place on a well-floured plate, and freeze for 5 minutes. Roll out to a 12x12 inch square for a final time, and press the blueberries into the dough in a single layer. Carefully roll up, as you would cinnamon rolls. Press the roll into a 4-inch wide rectangle. Using the bench scraper, cut into 4 rectangles. Then cut each rectangle diagonally to make 2 triangles. Place on a baking sheet lined with parchment paper. At this point the scones can be baked or refrigerated overnight. Brush with melted butter, then sprinkle with sugar. Bake 18-25 minutes, or until golden-brown. Oh yum, those look so good! 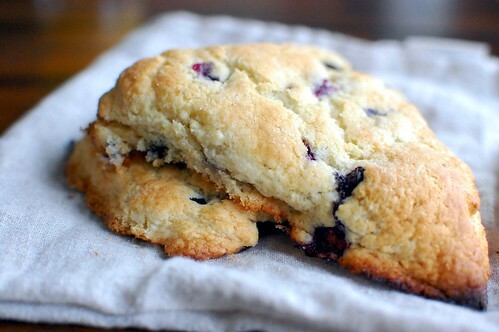 I could totally go for a good scone right now. Ooh I will definitely be trying these soon! Woah, I watched the video and am now completely intrigued. It was nice to see them break pieces from the scone so that I could get more of a sense of the texture. YUM!! Thank you so much for posting this recipe.